Since the Mirai botnet source code was leaked in 2016, it was inevitable that we’d see its variants being put to use in IoT threat campaigns. Apart from using brute-force techniques to attack IoT devices through various protocols, the botnet also seems to be leveraging vulnerabilities present in IoT devices to infect other IoT devices. These vulnerabilities are mostly in management frameworks and, by exploiting them, attackers are achieving remote code execution. This typically results in turning the infected device into a bot which in turn forms a bigger botnet army. In some cases, we also saw cryptominers as the final payload delivered in the IoT campaigns. The Zscaler ThreatLabZ team has been actively tracking these IoT attacks and analyzing their behavior, exploits, and payloads. In this blog, we will summarize our observations about a few of the more prominent IoT attacks we observed. The graph below shows the IoT attacks we detected over the last three months. We observed a significant spike in detection at the start of January 2019. The spike was due to the heavy adoption of the ThinkPHP exploit, which we’ll describe later in the report. The RIFT botnet emerged in December 2018 and uses a variety of exploits to infect IoT devices. According to online sources, the botnet used 17 exploits. The table below includes some of the more prominent RIFT exploits and those that continue to be active. Most of the vulnerabilities exploited were Remote Code Execution (RCE) or Command Injection types. It was surprising to see the use of WordPress-based websites into IoT devices. This indicates the use of readily available frameworks in IoT devices is increasing due to ease of integration. Let’s take a sneak peek into one of the exploits we observed in the RIFT attack. Post successful exploitation of this vulnerability, the “wget” command downloads the shell script payload from the URL “hxxp://89[.]46[.]223[. ]70/airlink.sh” and stores the payload using “-O” switch to “/tmp/666trapgod”. Later, it changes the permission of the shell script file to 777 (full permissions), which makes it executable and then runs it from its location in the “/tmp” directory. The static analysis of the unpacked payload reveals its contents. It contains a list of known default usernames and passwords of IoT devices. The OS commands are injected through the query parameter “vars”. This follows a typical exploitation sequence observed in RIFT attacks (as explained above). The payload was downloaded from the URL “hxxp://orksecpatrol[. ]xyz/bins/rift.x86”, which is similar to what we saw in the case of RIFT. The payload downloaded from the ThinkPHP exploit also was packed with UPX and contains a list of well-known usernames and passwords. Similar exploits were also embedded in the binary that we saw in the RIFT botnet. The notable difference was that this payload now contains the ThinkPHP exploit. It appears that the RIFT attack incorporated this exploit into its arsenal. There was one more difference: a couple of vulnerabilities exploited over the UPnP SOAP (CVE-2014-8361) protocol in Realtek SDK Miniigd was using the user-agent string “NotRift/2.0” instead of the previously used user-agent “Rift/2.0” string. It has become evident that the RIFT botnet is also being delivered through the ThinkPHP exploitation. The URL downloads a shell script from “hxxp://89[.]46[.]223[. ]70” and drops it into “/tmp/” directory with file name “ff”. We noticed that file names were totally random. Later, the file is made executable with the “chmod +x” command and is finally executed. The shell script contains download links of additional payloads for different architectures. The task of shell script is to remove all contents from the “/tmp/” directory, download the actual payload, make the payload executable, and finally execute the payload. It tries to download and execute payloads for many *NIX architectures including but not limited to .arm, .arm5, .arm7, .mips, .mpsl, .x86, etc. Once the payload is executed, it deletes all the payloads from the “/tmp/” directory, leaving no trace of the attack. The payload dropped from the exploit was not packed, and a simple static analysis of the file showed reference to another famous UPnP SOAP exploit (CVE-2014-8361) in Realtek SDK Miniigd. This vulnerability affects all the IoT devices embedded with Realtek SDK. This Mirai variant tries to exploit all the other devices with the embedded exploit of Realtek SDK Miniigd. In the first week of January 2019, we saw hits targeting NETGEAR routers. In these attacks, an old bug was being used for Remote Code Execution (RCE). NETGEAR DGN2200 and NETGEAR DGN1000 are vulnerable to this bug. The payload also tries to exploit the Home Network Administration Protocol (HNAP) in D-Link routers to download additional payloads. The following snippet was fetched from a payload that shows usage of HNAP. 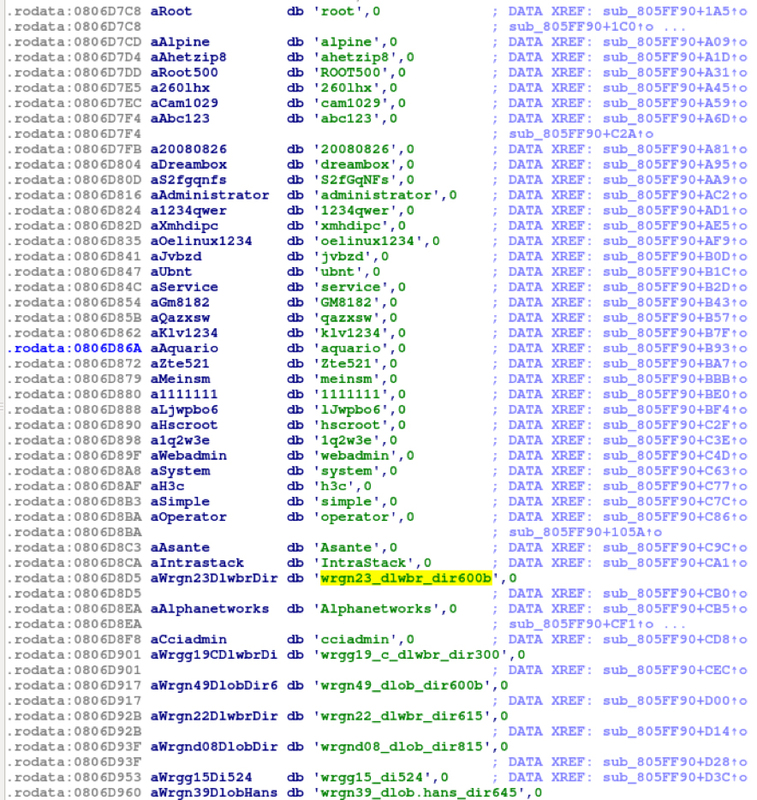 In addition, we found many embedded usernames and password, similar to what we saw in the AirLink case. The IoT space is evolving, and so is the attack surface of these devices. IoT devices need to be patched on a timely basis, which presents a challenge. IoT devices also need to be updated regularly. Even though techniques like brute-force attacks that use default passwords are not new, they remain effective because device passwords tend to go unchanged following installation. By hardening IoT devices and baking security in, many of the attacks we’ve been seeing can be countered.